Zotac announced a new addition to their ZBOX series – the Zotac ZBOX C-Series Mini PC. It shares some of the DNA from other ZBOX mini PC, but it features a new two-tone design and a completely fan-less cooling solution. The new C-Series includes three models namely: ZBOX C1660, C1640 and C1620 nano. It’s powered with the latest 8th generation Intel Core i7 processor. To be specific, the C1660 nano is powered by a Core i7-8550U quad core CPU, the C1640 with Core i5-8250U and the C1620 is powered by a Core i3-8130U dual core CPU. Graphics processing is handled by an Intel UHD Graphics 620 iGPU and features and HDMI 2.0 and DisplayPort 1.2 connectors. You can check out more details from the official news release below. ZOTAC Technology, a global manufacturer of innovation, is excited to present the most powerful passive cooled Mini PC – the ZBOX CI660 nano. Powered by an 8th Gen Intel Core i7 processor with an integrated Intel UHD Graphics 620 hardware, it’s the very first C Series Mini PC to feature an Intel® Core™ i7 level processor. 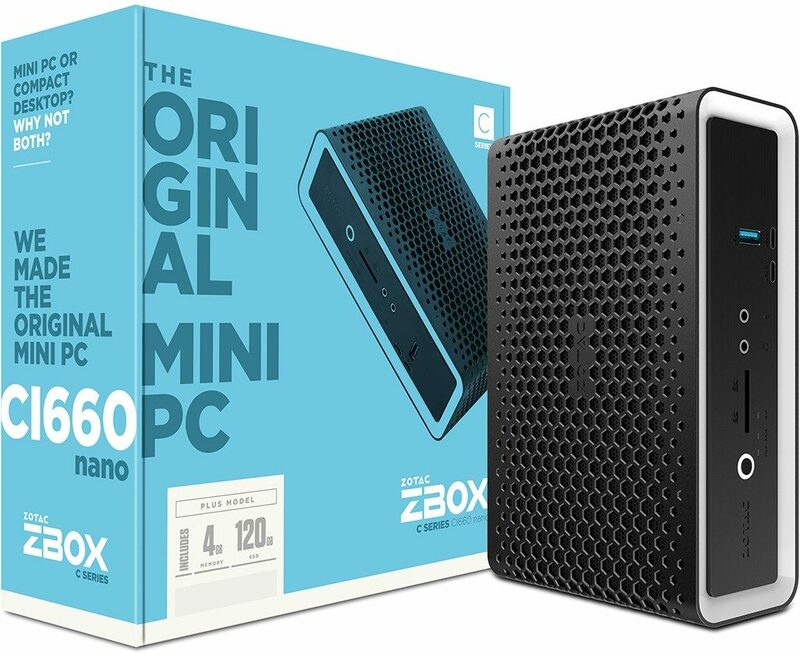 The ZBOX CI660 nano is branded with an all-new design complete from the ground up. Wrapped in a pattern of nature’s strong natural structures, the honeycomb, it has since become synonymous with the C Series passive cool line of Mini PCs. 90% of the surface area is designed with open ventilation for maximum breathability. Using a dual tone black and white color scheme with a matte finish, it brings a modern, timeless design to the usually squared dimension. The mix of style, design, and compactness at just 1.76L, helped to garner it a Computex 2018 design & innovation award. The all-new ZBOX C Series Mini PC is equipped with a more powerful passive cooling hardware, capable of handling up to a 25W TDP processor. That’s up to 66% more passive cooling power than previous generation C Series Mini PCs. Utilizing a wide array aluminum fin block that completely encompasses the internals and in combination with a design featuring a 270 degree of maximum breathability, both features enable the passive cooling hardware to be strong. Equipped with an 8th Gen Intel Core i7 quad-core processor, it’s capable of providing up to 20% faster performance than previous generation Intel Core i7 processor and many more times more than previous generation C Series Mini PC. With two available SO-DIMM memory slots, it’s able to handle up to 32GB of DDR4 2400 memory. Featuring 2x USB 3.1 Gen2 Type-C ports and 5x USB 3.0 ports, the expansion capability rivals some larger systems in addition with Bluetooth 4.2, 802.11ac Wi-Fi, Dual Gigabit LAN ports, DisplayPort 1.2 and HDMI 2.0 for 4K @ 60Hz support. Easily upgrade the Mini PC with tool-less access to SO-DIMM memory slots and 2.5” HDD/SSD bay for simple expansion. With VESA mounting compatibility, it also adds nimble versatility and mobility that allows the user to lay it, hide it behind a display, or hang it. 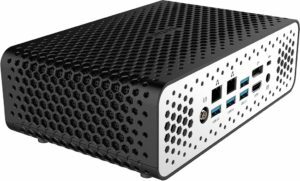 Other models available with the all-new design include the CI640 and CI620 nano featuring an 8th Gen Intel Core i5 and i3 processor. All models will be made available in Barebones configuration or PLUS configuration with memory and storage pre-installed.